A Quaker Meeting for Worship creates a space of gathered stillness. We come together to listen to the promptings of love and truth in our hearts, which we understand as rising from God. Our meetings are based on silence: a silence of waiting and listening. Most meetings last for about an hour. The silence is different from the silence of solitary meditation, as the listening and waiting in a Quaker meeting is a shared experience in which worshippers seek to experience God directly. 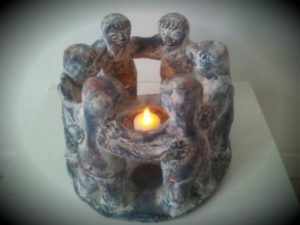 The seating is usually arranged in a circle or a square to help us to be aware of each another and conscious of the fact that we are worshipping together as equals. As everyone is equal there are no priests or ministers. Someone present may feel inwardly prompted to say something which will deepen and enrich the worship. Anyone is free to speak, pray or read aloud if they feel strongly led to do so. In the quietness of the meeting we can become aware of a deep and powerful Spirit of Love and Truth, transcending our ordinary, day-to-day experiences. This sense of direct contact with the divine is at the heart of the Quaker way of worship and nourishes Quakers in the rest of their daily lives.